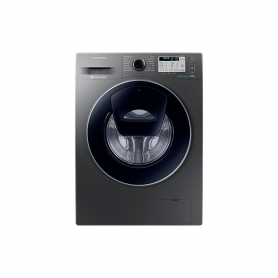 This Hotpoint washing machine will make doing the laundry a breeze. Enjoy a high spin speed and capacity, as well as a great range of programmes and clever features. The NM11946WSA model is also exclusive to Euronics and Agent stores, so you won’t find it at any other retailer. Featuring a 9 kg wash capacity, overloading will never be a problem with this Hotpoint washing machine. And, with a 1400 spin speed, you will receive pristine garments that take less time to dry. This freestanding washing machine keeps your laundry needs in mind – making sure your wash is adapted to you and your clothes. The Hotpoint NM11946WSA features an innovative system called ActiveCare, which takes extra care of your garments. It removes more than 100 stains at only 20°C, thanks to the combination of three different actions – Active Mousse, Active Drum and Active Load. The Steam Pack also offers double benefits – Steam Hygiene eliminates 99.9% of bacteria while Steam Refresh revives your garments. Plus, the Delay Start function enables you to pre-set a programme for a time that suits your schedule. This model has an energy rating of A+++, so it is highly efficient. The Rapid Eco option also allows you to choose between a time reduction and energy-saving action on selected programmes. 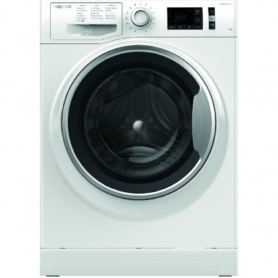 Look forward to saving on your bills and carbon footprint with this Hotpoint model. Coming with a white finish and exclusive silver door, the Hotpoint NM11946WSA will look right at home in your kitchen or pantry. Choose this washing machine from Hotpoint and take care of your laundry, trouble-free. Buy the NM11946WSA today. Steam Pack: The Steam Pack offers the double benefit of steam: the Steam Hygiene eliminates 99,9% of bacteria, the Steam Refresh revives your garments. Rapid Eco: A special option that allows consumers to choose between a Time reduction and an Energy saving action, available only on selected programs.